Colorful, diverting and epical version of Homer’s adventure story is family entertainment at its best. Now in its third year, The Public Theater’s Public Works presented the third and last part of the Lear deBessonet/Todd Almond trilogy, a stage adaptation of Homer’s The Odyssey. Truly epic in scale, this ambitious musical is colorful family entertainment at its best. 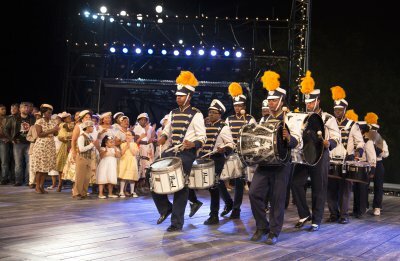 The huge cast included professional actors as well as 200 New Yorkers from all five boroughs in partnership with community organizations. 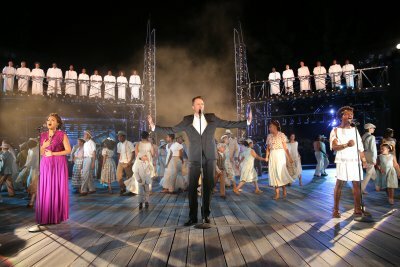 The inspiration for Public Works has come from the 1916 historical pageant movement in which 1,500 New Yorkers came together to perform a community-based staging of Shakespeare’s The Tempest. Aside from the wonderfully eclectic score by Almond (jazz, pop, Latin, blues, Broadway, gospel, folk music, etc.) 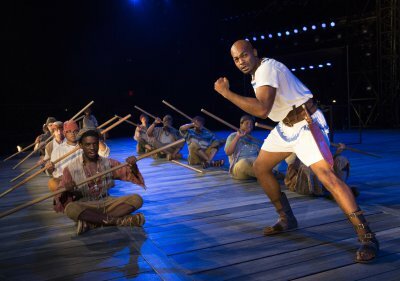 who also acted as narrator and singer, the production offered exciting performances by Brandon Victor Dixon as Odysseus, Karen Olivo as Penelope, Andy Grotelueschen as the Cyclops, Elizabeth Ely as Princess Nausicaa, and Travis Raeburn as the Prince of Phaecia. At times deBessonet was required to work as a traffic cop to get the large number of performers on and off stage, but her work with her leads both professional and newcomers alike was first rate. Conceived by deBessonet and written and composed by Almond, The Odyssey stuck very closely to Homer’s story, though it tells a somewhat abbreviated version of Odysseus’ adventures. Performed in two parts, the musical is told in the same tripart structure as Homer’s poem. In the first part, we see Penelope, Queen of Ithaca, a Greek island, weaving a shroud as she despairs of the return of her husband Odysseus who has been gone an additional ten years since the Trojan War ended. She is beset by many unruly suitors who wish to marry her and become the next King of Ithaca. She worries about her 20-year-old son Telemachus, who has never seen his father as he was born after Odysseus left for the war, whose safety is in jeopardy from the rowdy and pugnacious suitors. However, he is looked after by the goddess Athena, portrayed here by the 17-member gospel singing group, The Bobby Lewis Ensemble. Shifting to Part Two, Odysseus washes up on the island of Phaecia and is found by their princess Nausicaa on the day of a tribute by the islanders to the supposedly fallen hero, with The D.R.E.A.M. Ring as the locals. At first he remains silent, but eventually is persuaded to tell his story. We then see reenactments of his adventures with his band of soldiers on the islands of the Cyclops, the one-eyed monster, and the temptress Circe who can change men into animals. In an imaginatively staged scene, his men row past the land of the Sirens who lead men to their deaths on the rocks of their island. After a visit to the spirits of The Underworld (performed by TADA! Youth Theater), they pass between the six-headed sea monster Scylla and the whirlpool Charybdis (performed in shadow play), after which only Odysseus remains alive. Part Three begins with a Dream Ballet (played by the New York Youth Symphony) in which Odysseus is returned to his island home and meets up with his son Telemachus to whom he reveals himself, but does not inform his wife though he has an interview with her. Perceiving the threat of the many suitors, the hero disguises himself as a beggar. When Antinous, the leader of the suitors, discovers that the reason Penelope’s shroud never gets finished is that she has been unraveling it nightly, it is necessary for her to choose a new husband. When she arranges a completion with Odysseus’ bow and arrow and a row of axes, it is her husband who wins, and he and Telemachus dispatch the malevolent and wicked suitors. The palace guard was rousingly performed by the drummers of The Marching Cobras. Several songs of reunion and reconciliation end the work, bringing Dixon, Olivo and Almond together. Dixon made a stalwart Odysseus, as well as a tremendous impression in his one solo. Oliva was both an impassioned Penelope and a sultry Circe (as also played by Silvana Mangano in the Hollywood film version). Backed up by eight members of the Flamenco Vivo Carlota Santana II, she performed a show-stopping number called “Come with Me,” complete with Lorin Latarro-Kopell’s foot-stomping choreography. As the Singer who related the story, Almond, backed up by the Calliopes (Kelly Campbell, Joanna Fuentes and Mayelyn Perdomo), demonstrated both a fine voice as well as witty, amusing narrative persona. Grotelueschen stole his section of the evening as the voracious and egocentric Cyclops. Lucas Caleb Rooney brought a note of the sinister as Antinous, the leader of suitors, backed up by the Riders from The Old Bones Motorcycle Club, N.Y.C. Fire Riders, and M.L.C. Crew. Ely and Raeburn as the young royals of Phaecia were amusing as contemporary beach revelers. Paul Carey performed a yeomen’s feat designing the colorful costumes for the enormous cast of 200. The clever two-level unit set as well as the lighting was the work of Justin Townsend. ACME Sound Partners was responsible for the clear speaking and vocal portions of the production. Wig and make-up design for the denizens of The Odyssey was created by Dave Bova. The Community Partners who played Penelope’s Women, Odysseus’ Men, the Sirens, and the Citizens of Ithaca were made up of Brownsville Recreation Center, The Children’s Aid Society, Domestic Workers United, The Dreamyard Project, and Fortune Society. While the dialogue and style of the show were both contemporary and unsophisticated, the show intended to showcase community groups proved to be entertainment for the whole family without need of explanation. Lear deBessonet’s staging incorporated the strengths and weaknesses of its non-professional partners, while Almond’s witty and melodic score received an excellent rendition. This musical adaptation of The Odyssey was fun for all ages, both those who knew the story and those hearing it for the first time.